Happy Valentines's Day! I love Valentine's Day. I've always loved it. From elementary school shoe boxes filled with sweet notes from classmates, to a Valentine Card and little present on the kitchen counter from Gary, I love it. One of my favorite memories was walking into our kitchen for supper when I was about 8 on Valentine's Day. My mom had hung lime green polka dot patent leather tote bags on the backs of our chairs. The bag had a sleeve on the outside that held a matching umbrella. So sweet. And so Doris Day! Another reason I love Valentine's Day? It's Eddie, my dog's birthday. Yes, we talked about naming him Romeo, Valentine, and many other more romantic names, but he was and always will be, Eddie. Here's the birthday boy. He's 1/2 German Shorthair and 1/2 Blue Heeler. And quite a guy. Today he's seven, and acts like two. Our French Friday's with Dorie group decided to have a cookie swap to celebrate the day. The swap was organized by Alice. (Thanks, Alice!) We each got the name of the Valentine, and made them a dozen cookies. The box also included a recipe, and a little present. My box arrived, and was so fun to open! Susan Lester had my name. Inside the big box was TWO boxes of delicious cookies, a pretty ceramic heart, complete with rose petals, and a tres jolie Valentine. Thanks, Susan! Her blog is CreateAmazingMeals.com She knew just the right theme. An Eiffel Tower and I'm in! The cookies are fantastic! Chewing, very flavorful and perfect for an evening snack. Ok, I ate two right away and am tempted to have another very soon! Inspired by Marcel Desaulniers “Mrs. D’s Chocolate Chip Cookies” from Death by Chocolate Cookies. Start on low speed, slowly increasing to medium-high. Drop cookie dough onto parchment paper-lined baking sheets (about 1 ½ Tablespoons). Bake for 25 – 30 minutes, according to your preference. I hope you'll make these and visit Susan's site for more recipes and ideas. Happy Valentine's Day! Be kind. Welsh Rarebit, Steak Diane, Pavlova and Peach Melba. All recipes we've heard of and maybe some of us can describe. 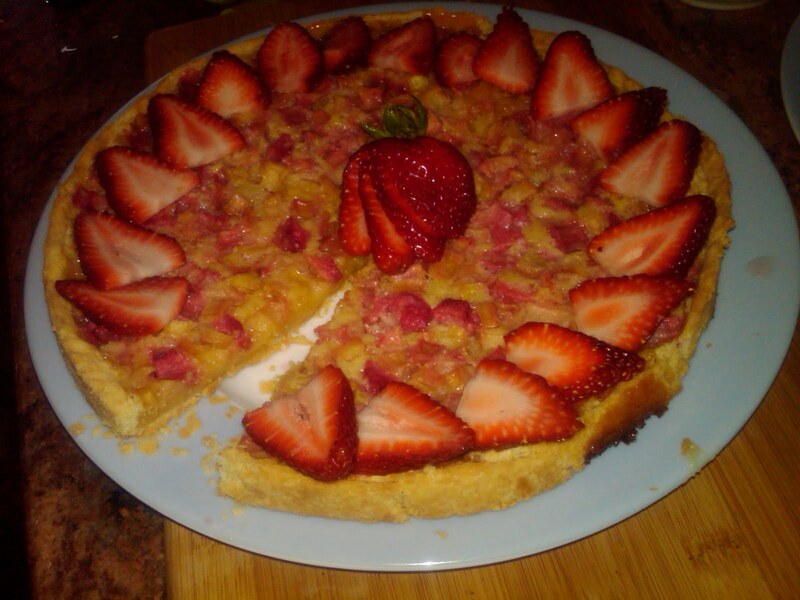 Last week, the Around My French Table/French Friday's with Dorie group made Peach Melba. I was thinking of something crunchy. Perhaps in the Melba toast family. What is it you ask? Think about the best peach you're ever tasted, with fresh raspberry sauce, over ice cream... with just a touch of liqueur. Yes, that's it. Fresh peaches are poached in simple syrup with vanilla bean, then cooled and chilled. While the peaches are chilling, the berries are pureed and combined with just a bit of the syrup. It's that easy. 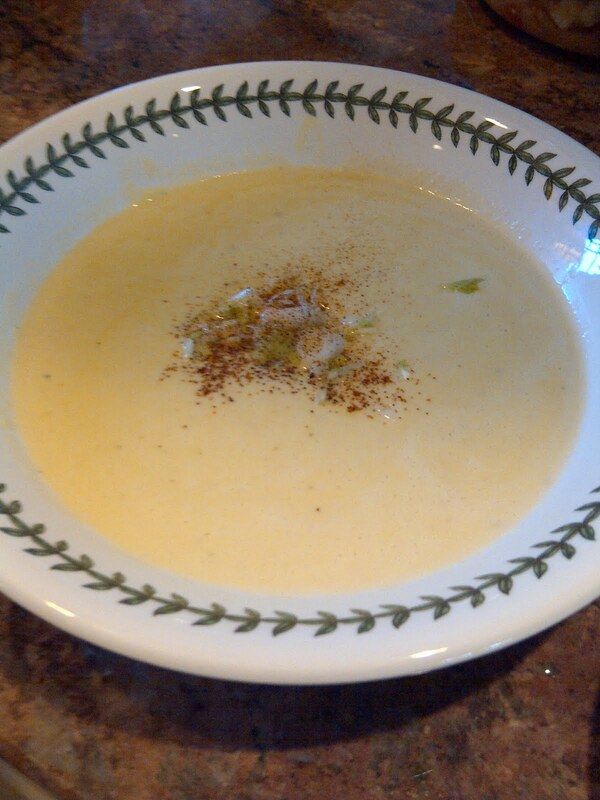 Once the sauce and peaches are ready, spoon over vanilla cream and add some sliced almonds. The scent of the vanilla is amazing. I used St. Germain, and elderflower liqueur rather than the Chambord that was suggested in the recipe. I don't think you can go wrong with either. As summer transitions into fall, this is the perfect summer comfort food. I hope you'll try it, and enjoy the sweetness of this classic. 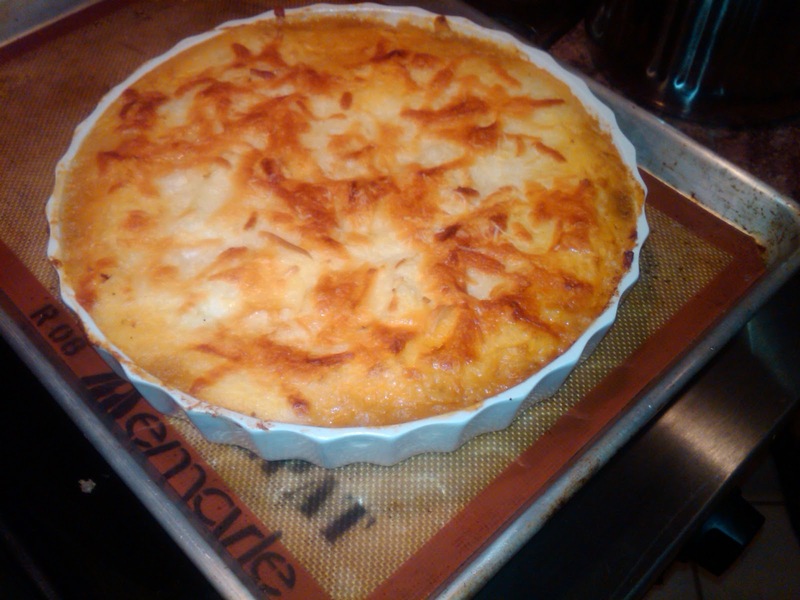 This recipe wraps up the April collection of French Fridays With Dorie's recipes that some loved and some tolerated. That's ok, everyone has something they're not crazy about. 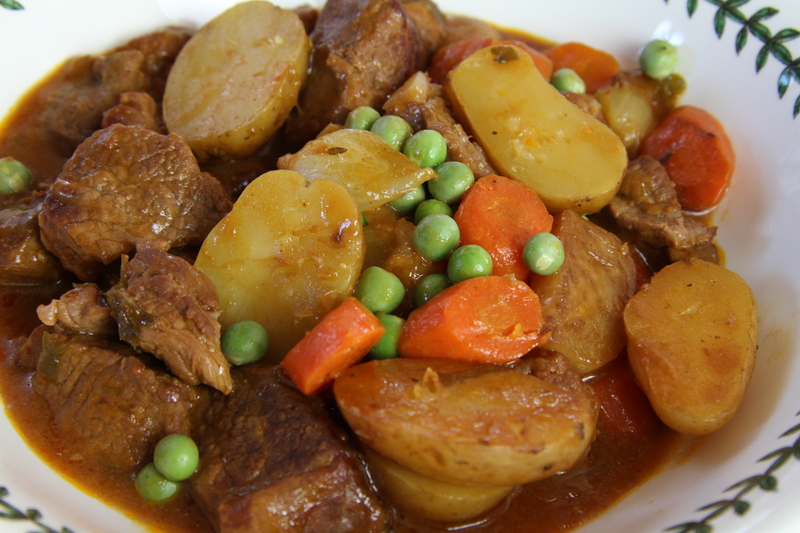 Lamb Navarin Printanier is a lovely aromatic stew that is nice on a cool spring day, or a crisp autumn supper. If you like Boeuf Bourguignon, this is for you. But you'll have to have your wine on the side with this one. Earlier in the week, I called the local butcher and asked about the availability of lamb shoulder. No dice. He did have a leg of lamb that could be boned out, and cubed. We talked about the amount, and I picked it up today. My idea of trimmed and the butcher's idea of trimmed were very different. I like the meat very "clean". None of the silver skin stuff, very little fat, no icky stuff. So I re-trimmed the meat, and ended up with quite a bit less than I had expected, but I'm sure that each bite will be good. Here's another interesting tidbit. 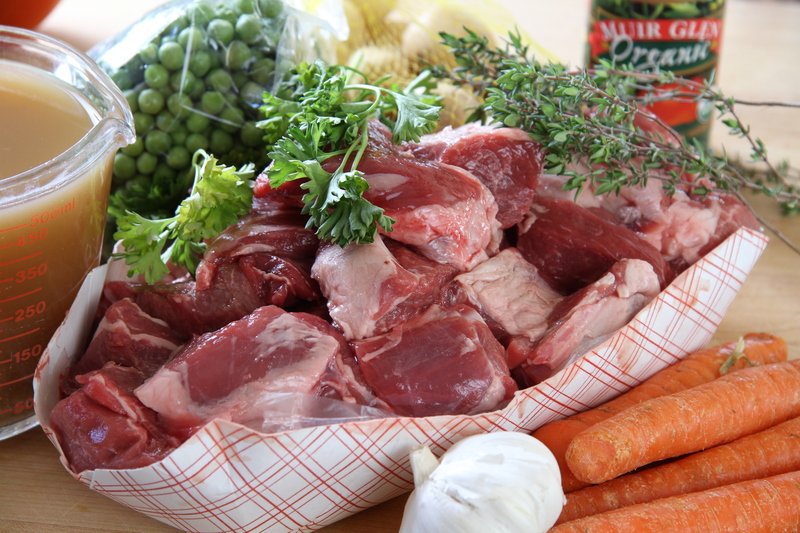 In an article I found about lamb stews, the leg is not suggested because when it's braised, it can become stringy. Yikes! It was too late for re-do's, so I'll have to see what happens after the stew is finished. I decided to make up for less meat with more vegetables. 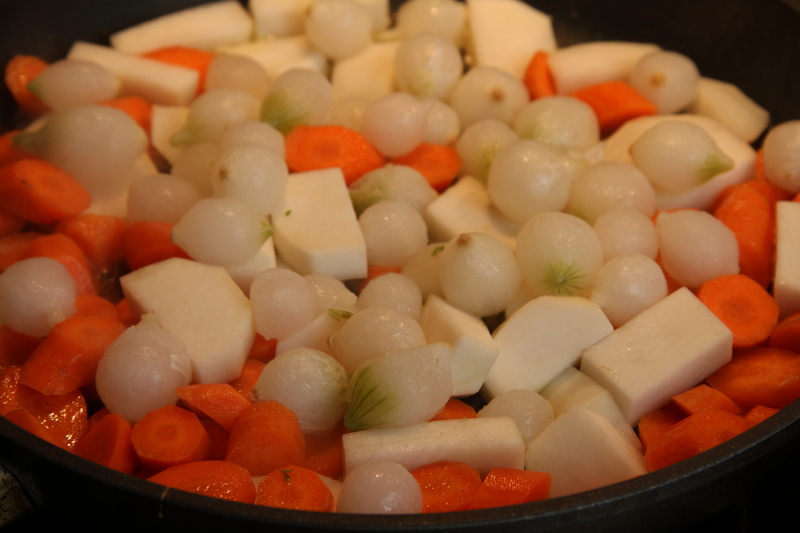 I added two or three more carrots, one more turnip, and doubled the onions & potatoes. That's just fine with me. Most days I'd rather eat vegetables than meat anyway. Here's the meat pre-trimming. The recipe starts off with searing the meat. Hmmm, I guess I forgot what lamb smells like. Not bad, just not beef. I didn't have to do a lot of rearranging or batches. 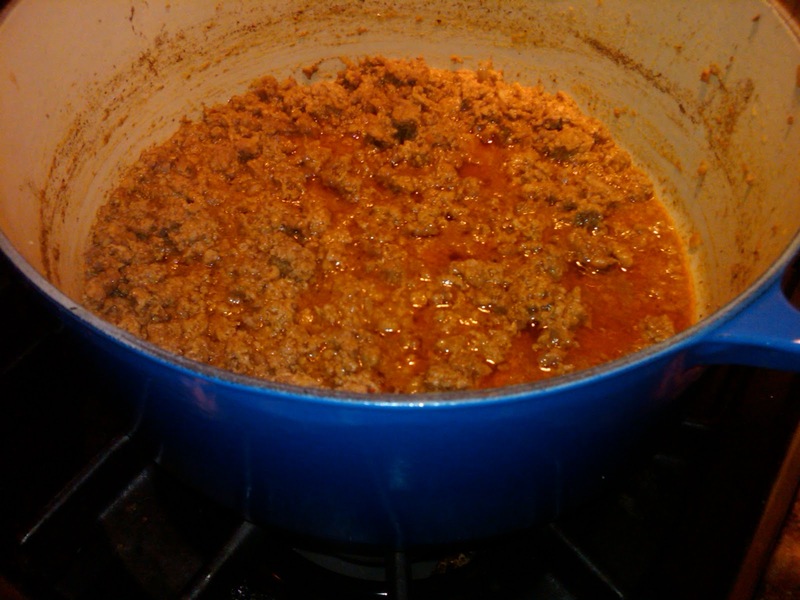 The meat had a nice even sear, and made lots of nice crispy fond in the bottom of the cast enamel pot. 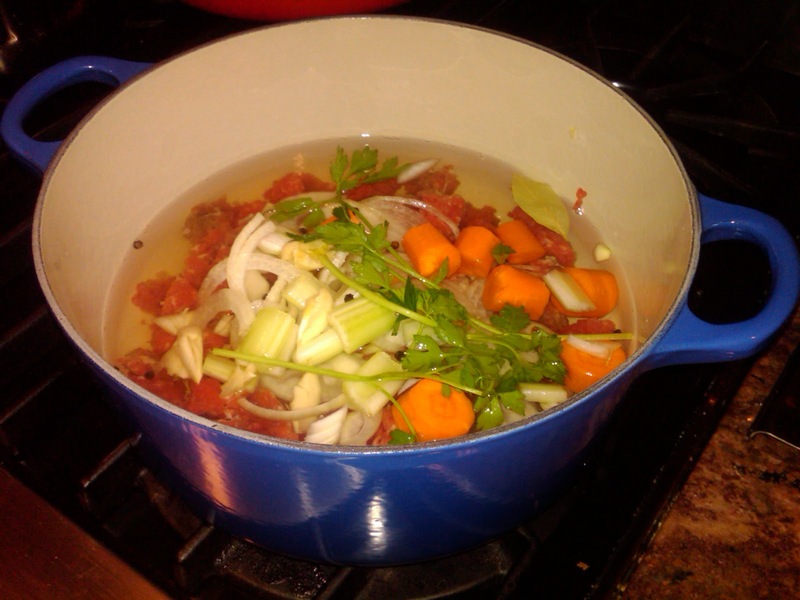 The meat was combined with the stock, herbs and tomato paste and set to simmer. I have a very cool item to tell all of you about. This isn't an advertisement, and I'm not a spokesmodel, but I found something really cool, created by Michael Ruhlman. If you make your own stock (which I usually try do, but didn't this time), and use cheesecloth to stain, here's just the ticket. He has three reusable cloth squares that can be used to strain yogurt, stock or anything else that may need straining. If you don't know about Michael, he's a great writer, and has several books. The one I recommend most is Making of a Chef. He writes about his education at the Culinary Institute of America through of the eyes of a journalist. A great easy read. 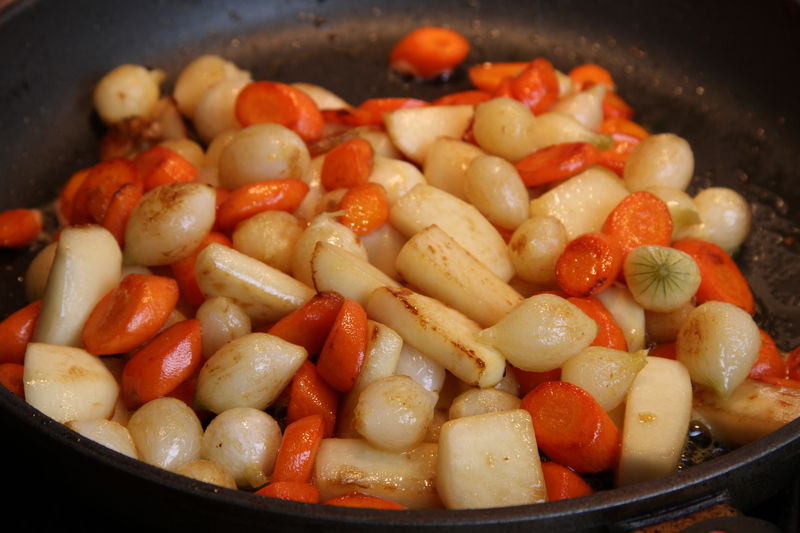 My favorite part of the recipe was caramelizing the vegetables. It took about 10 minutes, and they were glistening, golden and not soft as Dorie instructs in the recipe. Here's a before and after photo of the vegetables. We found some delicious fresh English peas in the store! Just perfect for finishing touch. 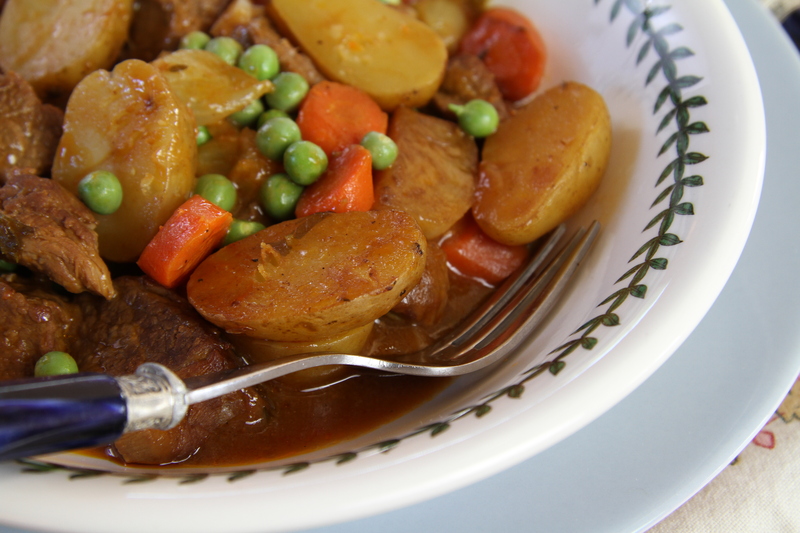 I'm not going to serve the Navarin until tomorrow, so the peas will go in after I reheat tomorrow. It's been awhile, but I'm going to bring it back to temp ala Sous Vide. Using that technique, the meat won't overcook and or get rubbery like it might if I used a microwave. 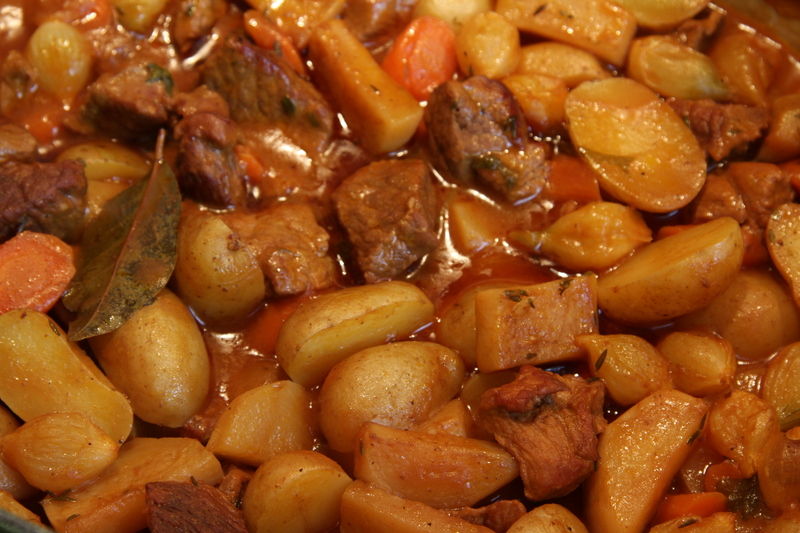 The finished stew is delicious. The lamb tasted perfectly tender. No stringy meat. So go ahead, go crazy and use leg of lamb if you want to! Happy Spring! If you're looking for other great spring dishes, you might want to take a look at these for inspiration. What a nice surprise! I was nominated by Maggie at Always Add More Butter for the Versatile Blogger Award. She's been nominated too, and it's well-deserved. The nomination comes with a few requirements. I need to give you a list of my personal favorite blogs. Some are really famous, and some are little blogs like mine. They aren't in any particular order, though I read the Joy the Baker and Michael Ruhlman blogs every time there's a new post. There's a lot of food, photography, Paris and travel here. Guess you can tell what I like! Also, The French Fridays with Dorie and Tuesdays with Dorie blogging groups have many great bloggers. It's so hard to pick my favorites. There's so much to see and learn. 1. I almost hopped on a plane and came home from Paris before class started due to a scammed cab ride, botched hotel reservation and nerves. So glad I stayed! 2. I LOVE school supplies. Deep down, I'm a combination kindergarten teacher and Broadway singer/dancer. A new pad of construction paper, pencils... I'm there! The later... well it's just a dream. Can't sing, and rarely dance. I took ballet in college, but I was too old to try toe shoes. That was ok.
3. I'm kind of afraid of horses. As a tall kid, I always go put on the biggest horse who's only goal was to make a run for the barn. Horses are pretty, just with someone else riding them. 4. My favorite actresses are Gwyneth Paltrow and Meg Ryan. I don't like scary movies, sad movies, or too much sci-fi. Give me a romantic comedy any day! 5. I play the piano and am trying to re-learn the french horn. I've played the piano since 2nd grade. I would love to take piano lessons again to keep up my skills. I don't know if I'll ever really play the French Horn again, but it's such a great instrument. Who can resist the sound of the horn soaring over the orchestra? 6. I love the smell of subways (ok, we all know what that smell is... it just reminds me great trips). I love to shop (shoes, purses, cooking supplies...) Since we live in the country, our vacations are in busy, urban places. 7. My dream day is cooking all day, setting a pretty table, and enjoying a long evening a laughing, talking and eating with friends. Not too random, but very true. Thanks again for the nomination, I'm looking forward to Friday! It's been a few weeks of recipes that have fans or foes. Sardines, now coconut. Sorry for the extremes. For those who don't like coconut, this may not be your recipe. For those that do, you'll want to read on! This ones for you. This little tea cake is packed with coconut flavor. The recipe was quick, easy and used things you have on hand. The coconut was in rather large flakes, so I gave it a whirl in the food processor to make the coconut pieces more uniform. The ingredients went together nicely, and the final batter was smooth, and shiny. 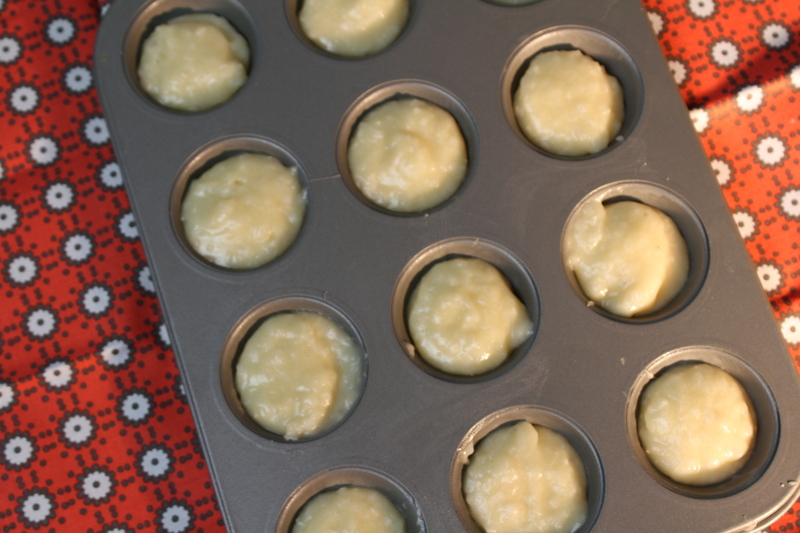 I used a pastry bag without a tip to fill the molds (the mini muffin tins). A word on the muffin pans. Be sure to really butter them, and add a quick toss of flour. You want these to drop out right away when they come out of the oven. The friands took all twenty minutes in my oven. I was waiting for them to brown, but they only browned around the edges and sides. The toothpick came out clean, so I was sure they were fully baked. The finished product was delicious. Even better after cooling a few minutes. 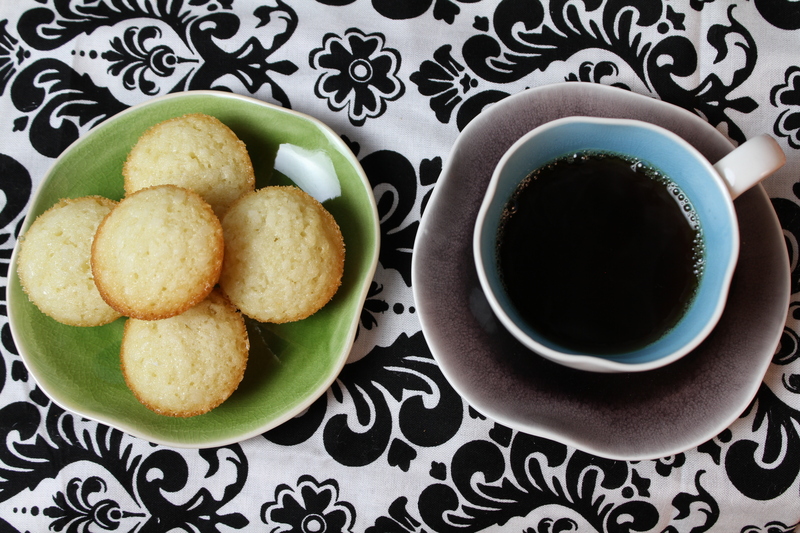 Think coconut macaroon meets a madeleine. Sweet, chewy outside, and tender middle. A strong cup of coffee and it's a perfect treat. 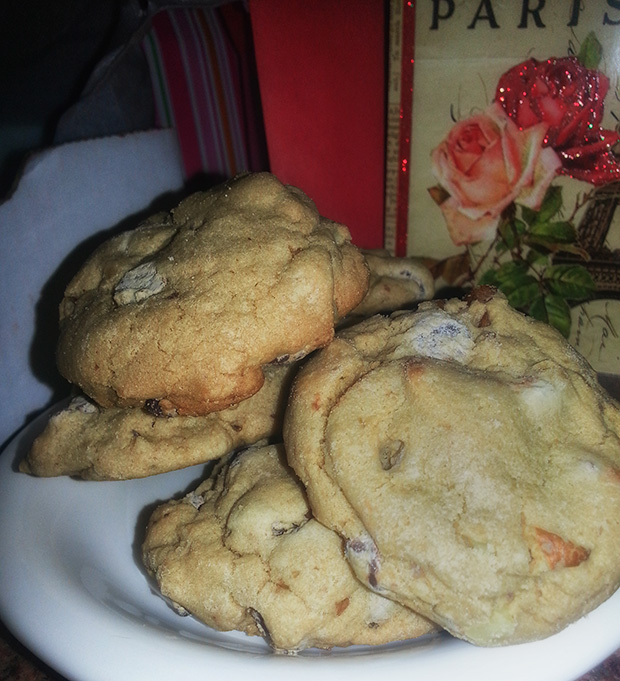 This week's recipe is from Baking with Julia, and is part of the blogging group Tuesdays with Dorie. As the old saying goes... "When at first you don't succeed, try, try, again"! Or how about, "If it's worth doing, it's worth doing right". So I did. Again. My first attempt at the Lemon Cake didn't go very well. It was my fault. I know exactly why. I didn't give the ingredients the attention they deserved. The cake was dense, but not in a good way, and a little tough. My redo was much better. I'll try to explain the details. The recipe has the usual cast of characters. Eggs, sugar, flour, baking soda, heavy cream, and butter. The first time, I read through the recipe and tossed the eggs & sugar in the mixer. First mistake. While it was ok and the right thing to do to add them together, it was way too much power. A gentle whisk was the ticket. 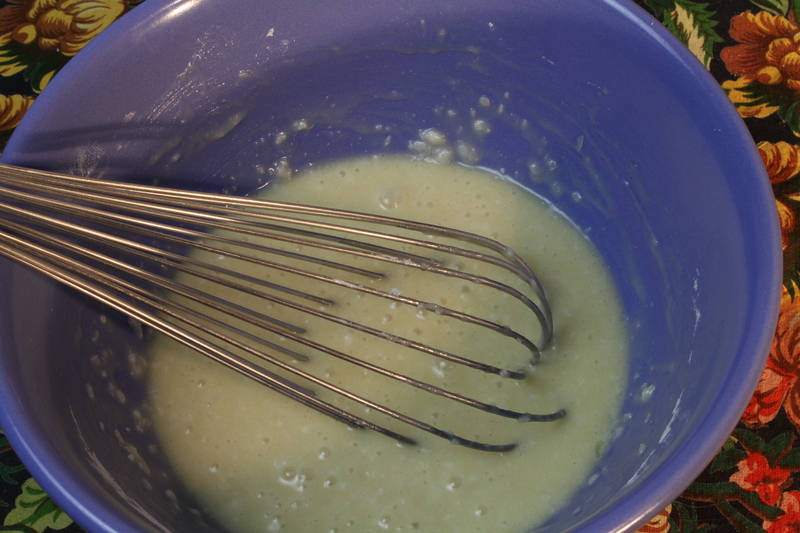 I mixed the second batch with a balloon whisk. 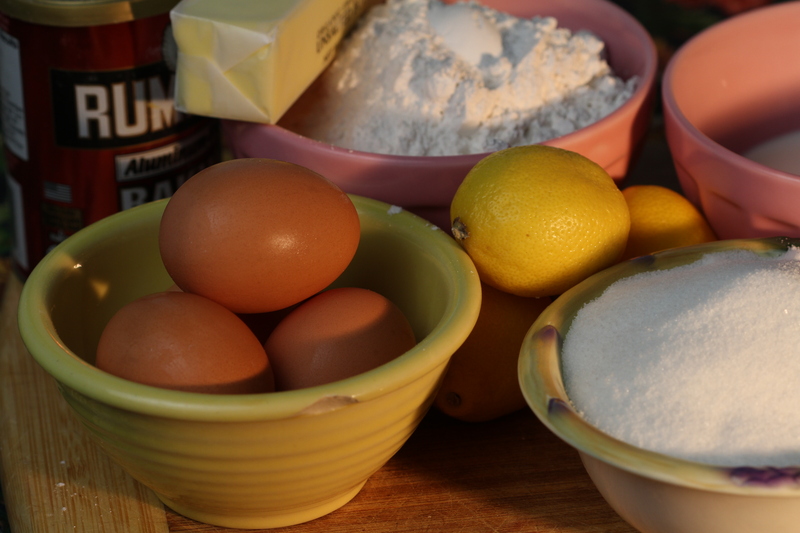 Remember that when you add eggs to sugar, you should start whisking right away. The chemical reaction that occurs when they mix is heat. You want the cake the be tender, and not have little bits of microscopic scrambled eggs making the texture - well... rough. Attempt one had no sifting. What was I thinking? 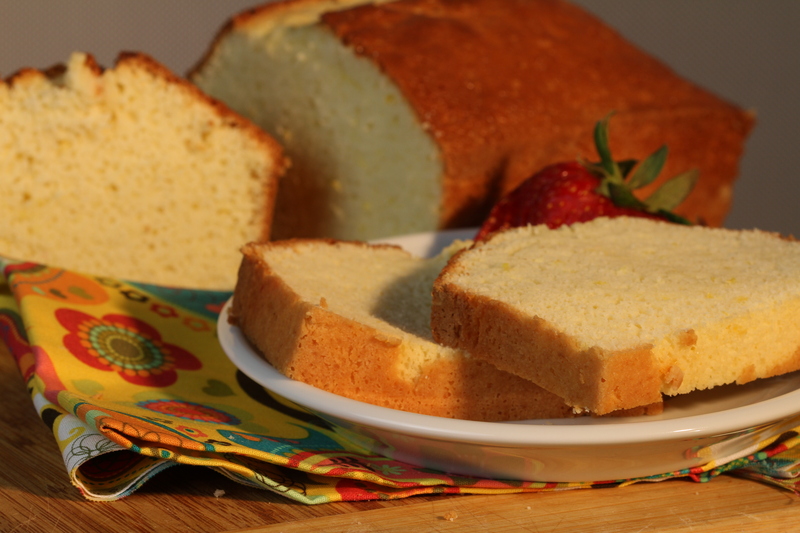 Any good sponge or simple cake like this should be sifted. 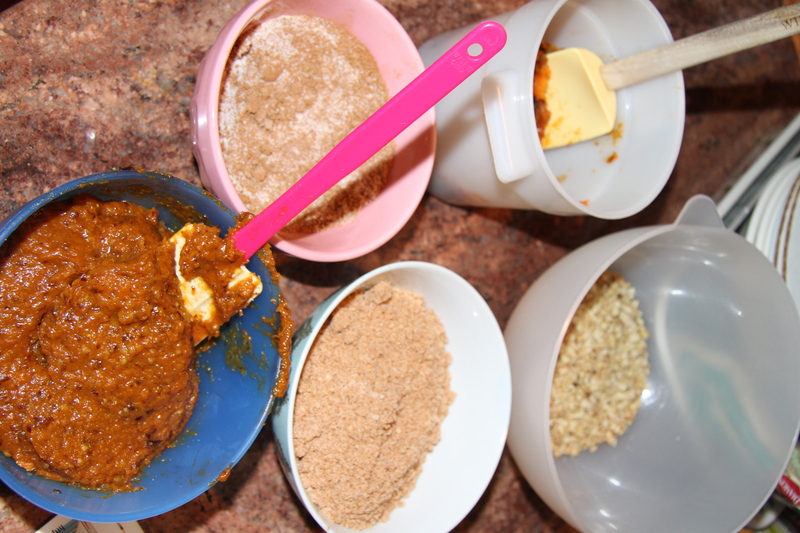 I got out my sieve and sifted the baking powder and cake flour together for a much lighter and well-combined mixture. If you don't have a sifter, just take your whisk and whisk the flour to fluff it and break up any clumps. Time for true confessions. The first time, I threw caution to the wind, and used all-purpose flour. The second time, I used real cake flour. Want to know the difference? Cake flour has very low protein. When you add the liquid and start to mix, very little gluten is created. Therefore, there's very little chance of creating elasticity and rubbery cake. For a cake with such simple ingredients, and only lemon zest for flavor, this is really important. 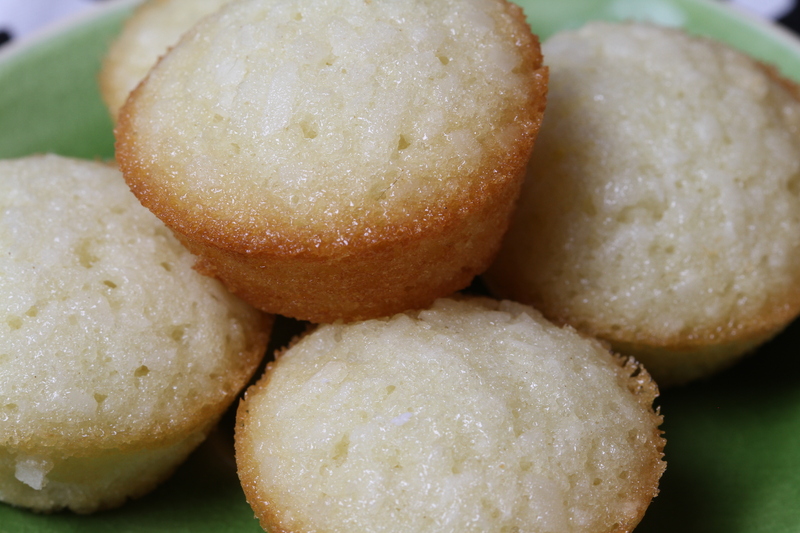 Don't get me wrong, all-purpose flour is great for some cakes, cookies and muffins. Just be careful not to overmix. Now on to the butter. This is a very picky point, but to make a great cake in this category (madeleines, pound cake, etc. 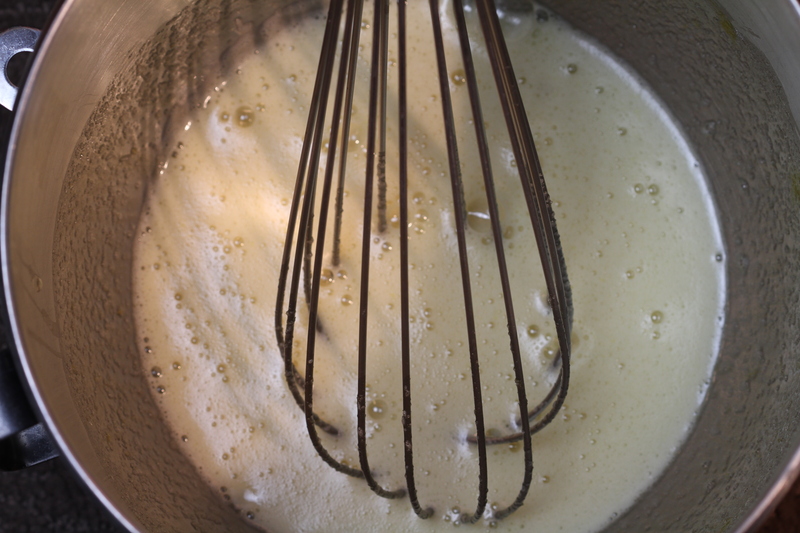 ), you want to be sure your butter is melted and cooled; and separated. Let the butter rest in the clear container. 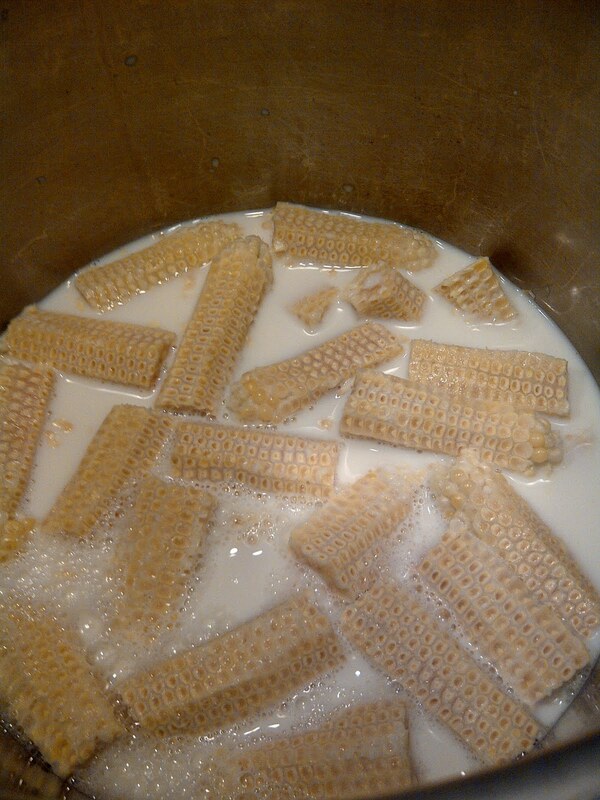 Allow the milk solids to settle to the bottom. When you pour the butter into your recipe, make sure those milk solids stay in the container and don't end up in the batter. 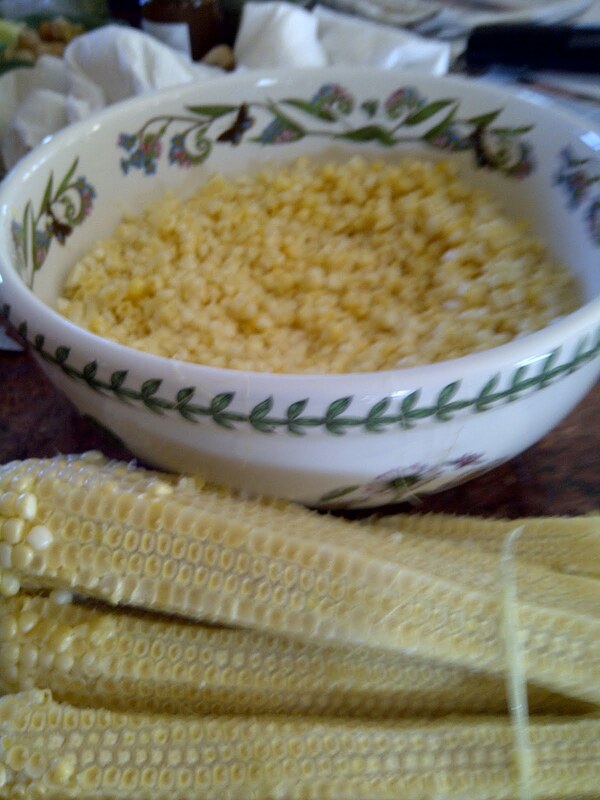 This will also help with a tender, light pleasing texture. 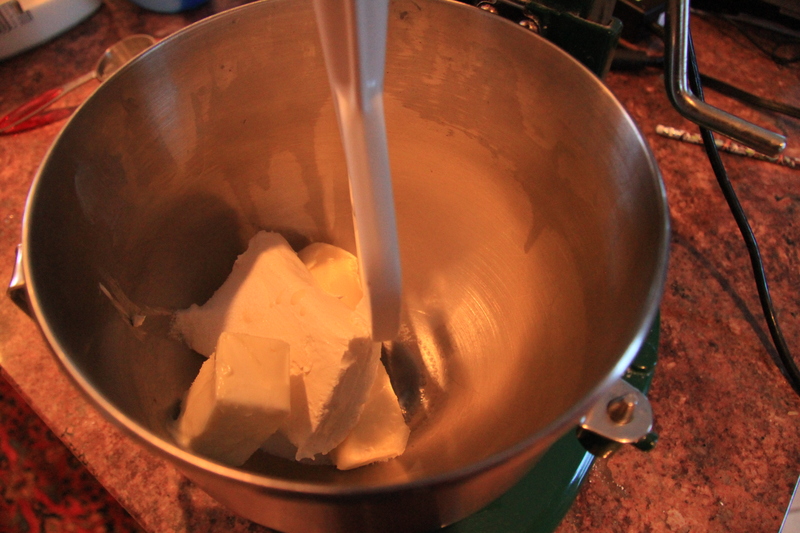 Here's a photo of the butter as it settles. See the milk solids on the bottom? I was going to scratch up this recipe to just average, when I realized it was me being average about my approach. It's a really gentle, sweet, cake perfect for any brunch, coffee, or present for a friend. I think it would be great grilled or toasted. Just one more quote for Eleanor Roosevelt, "It takes longer to explain why you did something wrong, than to do it right". From now on, no rushing, no shortcuts, and more happy endings! Thank you for listening to my long explanation! Please try this recipe and let me know what you think. Truc and Michelle, are the two hosts for this week's Tuesdays with Dorie - Baking with Julia and have the recipe posted on their blogs. 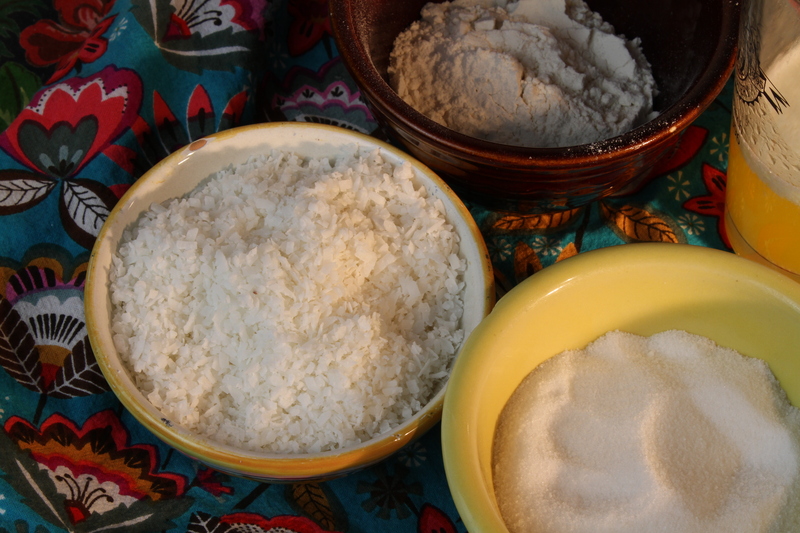 Coming up, a great recipe using coconut from Around My French Table. Talk to you soon! French Fridays with Dorie - Sardine Rillettes- Not scary, really! 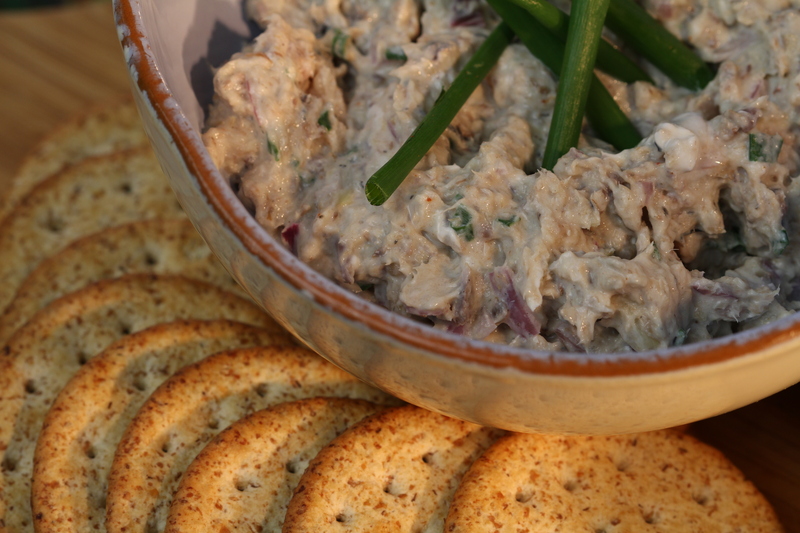 This week's French Fridays with Dorie recipe is Sardine Rillette. A wonderful quick, easy little appetizer spread. I personally like sardines. Growing up, my mom doesn't like steak. If our family was going to have steak she opened a can of sardines, spread some butter on bread, and carefully laid the sardines side by side on top of the butter. We could join her, or eat steak. I always choose the sardines. There was something about the whole ceremony that appealed to me. When you open a can with a key, and carefully roll back the metal top, it has to be good! I know not everyone shares my love. This recipe is really worth trying to acquaint yourself with sardines. 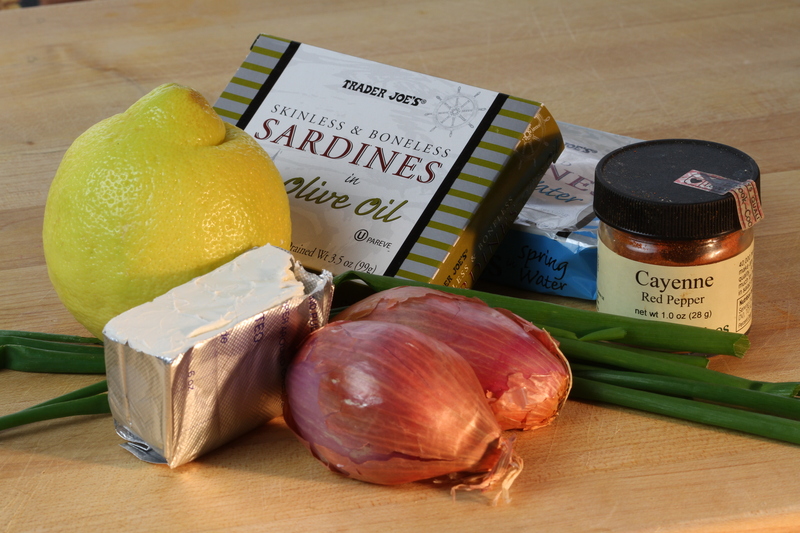 The recipe calls for 2 cans of sardines, and other ingredients that you probably have on hand. A little cream cheese, shallot, some herbs, and juice of a lemon. Guests are coming? You can have this ready in less than ten minutes. I used chives. They're growing outside our kitchen door, and I try to use them whenever I can. I was a Trader Joe's and found two kinds of sardines. Some in oil, and some in water. I bought a can of each to see what they were like. Sardines are much bigger now than I remember. I remember little guys about the size of your pinkie or slightly bigger. They guys are big (well, little but big) and packed in like sardines. Sorry, had to work that in somewhere! 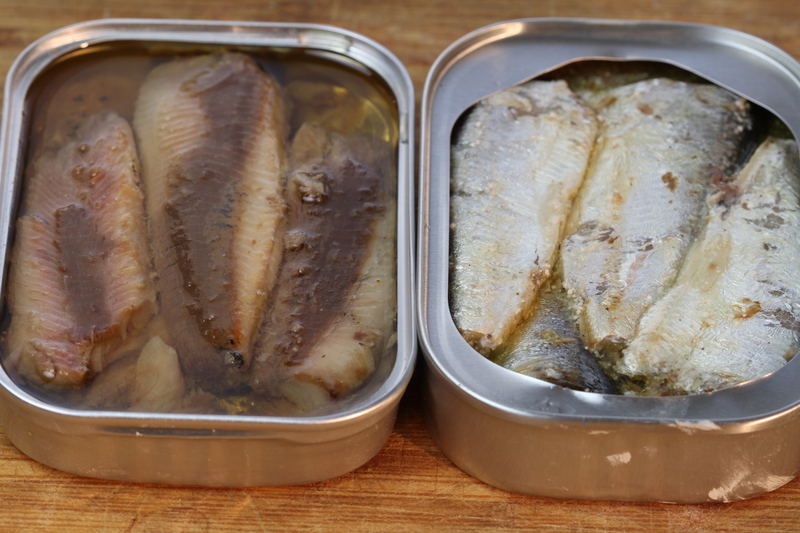 In one can, the sardines still had spines, so I pulled those out. I know they would have crushed, but just couldn't leave it in. Here are the two cans side by side. 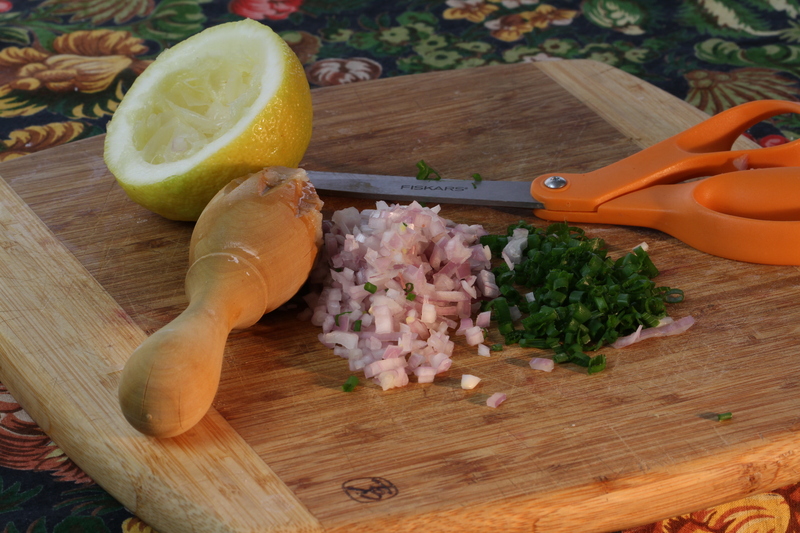 Some chopping and snipping and the ingredients were ready to combine. The sardines easily combined with a fork. The final preparation is a lot like a simple tuna salad. It would be really nice piped into the little puff, or a cherry tomato. Hope you'll give it a try! Next Tuesday is a lovely lemon cake by Julia. Love lemons. Talk to you soon! 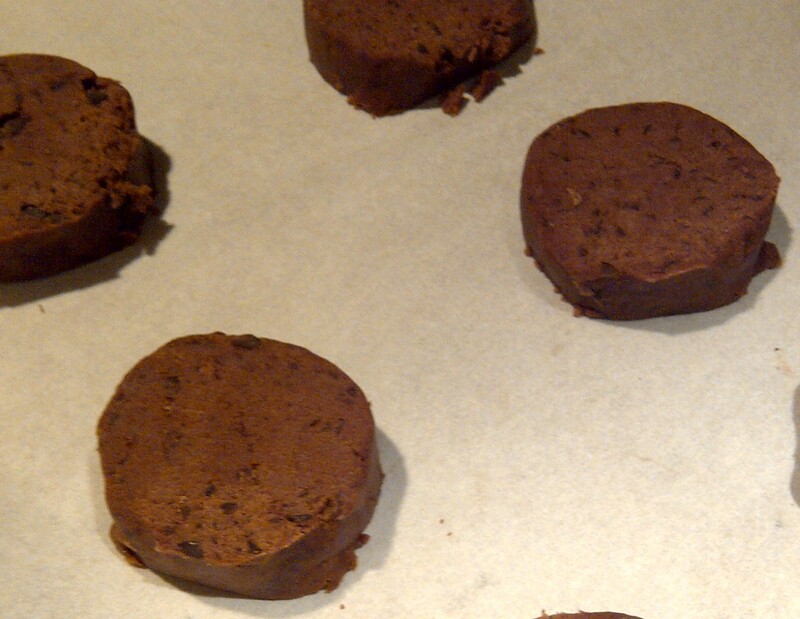 This week's French Friday's with Dorie recipe is Cocoa Sables. 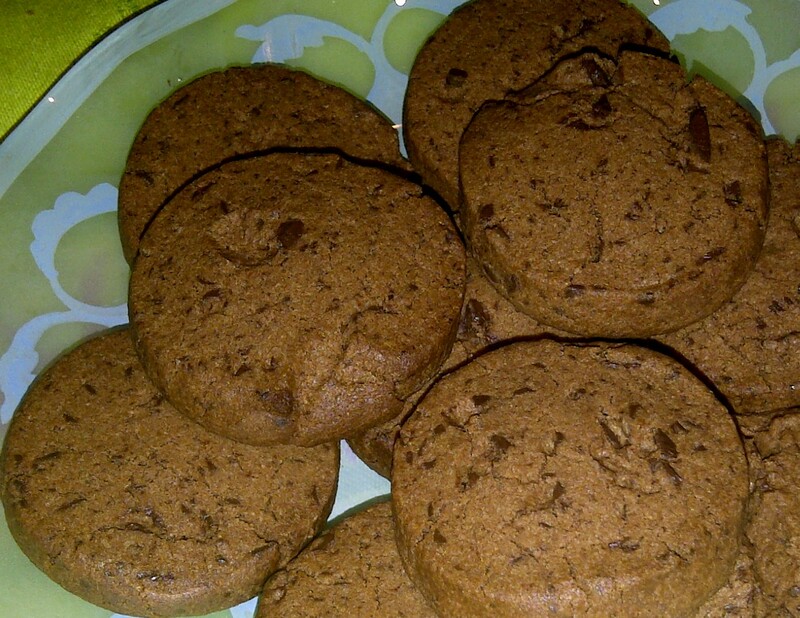 Sweet, crisp, chocolatey little darling French cookies. The should be an accent over the "e". I've been trying to figure out how to create that character without much success. From here on, please pretend it's there. Sables were the very first recipe we made in pastry school. For those of you sick and tired of pastry school stories, please skip ahead. This is a good one though. Our class went to the very first demonstration where we carefully watched the chef make a variety of sable, or butter cookies. 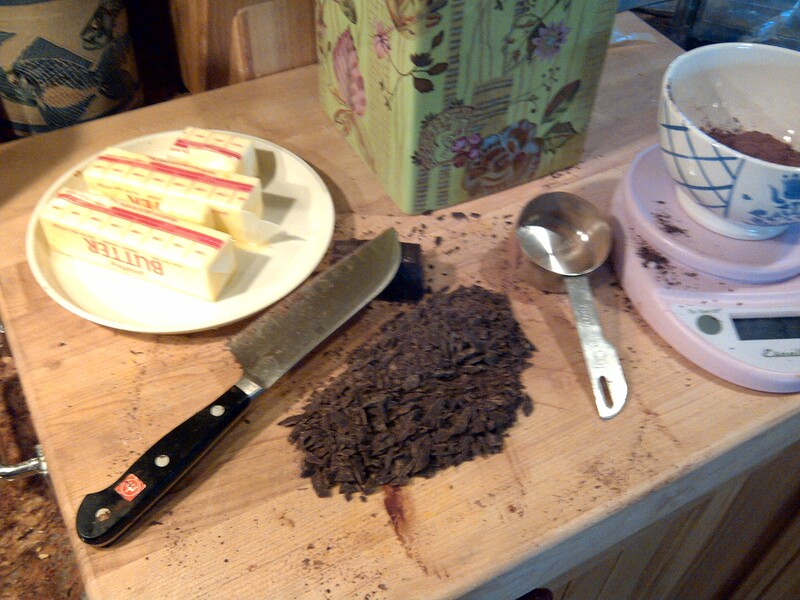 He stacked butter cookie dough on chocolate dough and made beautiful stripes, swirls and lunettes (eyeglasses.) One sable he called "dee -a -monde". The translator repeated the word Diamond. The name reflects the way that the tube of dough is brushed with egg and rolled in coarse sugar to make it look like it's rolled in diamonds. There were a few moments when I can think back and know they had me. This was one of those moments. I used a block of bittersweet chocolate and chopped/grated it very fine. It added a lot to the cookie, and I would highly recommend it. Back to school. When we got into the kitchen, we were introduced to weighing ingredients for the first time. The recipe called for 5 grams of salt. If we had thought about it, how much salt can there be in a cookie recipe? Well, we set off to the salt bin carrying mixing bowls that could have held 10 pounds of bread dough! We can back with what equaled about a teaspoon! We can laugh now. At the time, all business. Dorie's recipe uses a creamage method, using room temperature butter and gently mixing in all the dry ingredients. I really liked adding the chopped chocolate for a little extra boost of chocolate taste. I don't have a lot of how-to pictures this week. Here's the dough sliced and ready for the oven. 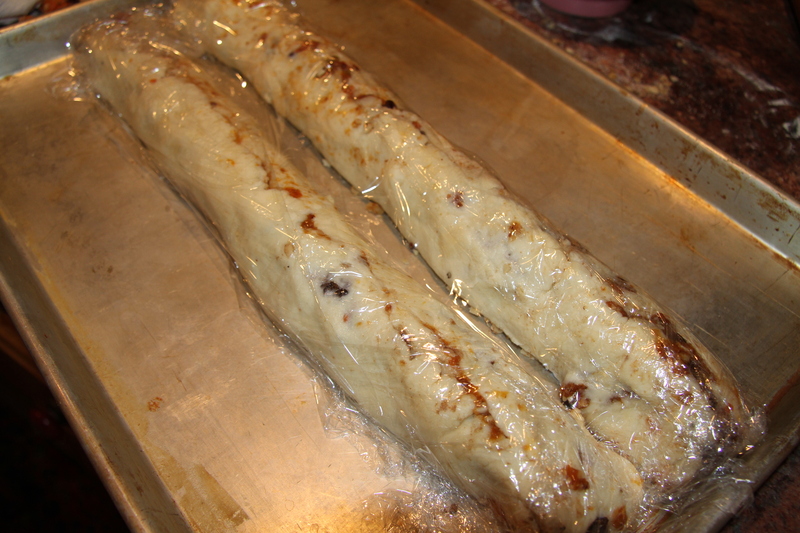 The dough is rolled into logs and chilled. During the chilling time, I pulled them out a few times to reroll and reshape the logs. 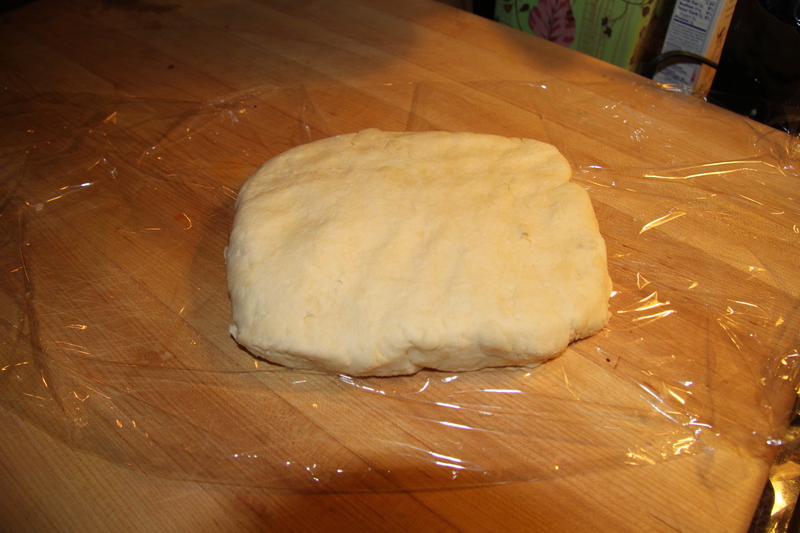 As the soft dough chills, it can get a flat bottom. Rerolling, helps make the roll even and not lopsided. The dough sliced easily. A few of the disks had to be schmoosed back together. The smell of the cookies baking a amazing! Here's a tip. When you can smell chocolate in the room, you can be sure that your dessert is almost done. I always wondered how the chefs knew that things were finished before the timer ever went off. The Sable are so good. This is a great dough to have in the freezer to quickly slice and bake for an impromto dessert, or to satisfy a chocolate craving! No need to defrost, just slice and bake. Have a great weekend, next week is Crab and Grapefruit Salad- curious? 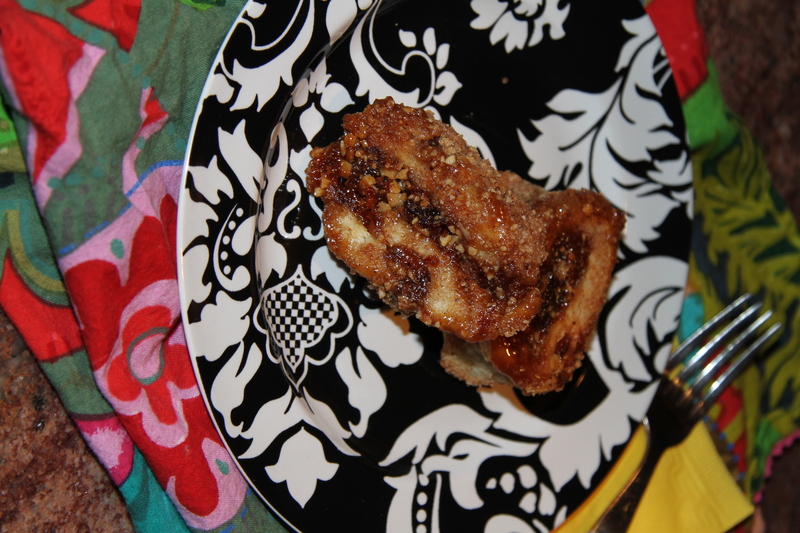 Baking with Julia: Rugelach... Divine! 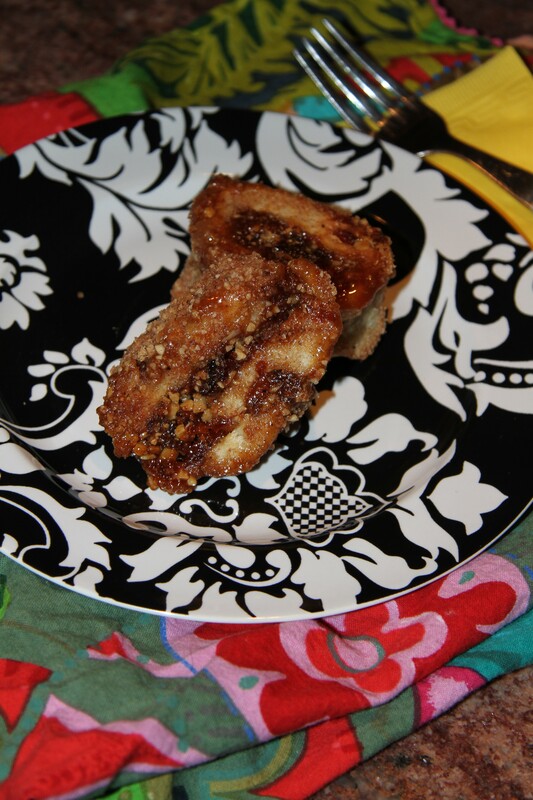 This week's Baking with Julia recipe is Rugelach. A lovely pastry cookie filled with apricot lekvar, dried fruits and nuts. I've made Julia's lekvar several times for wedding cake filling. It's so good! And simple. Cooked dried apricots with brown sugar, and almonds. 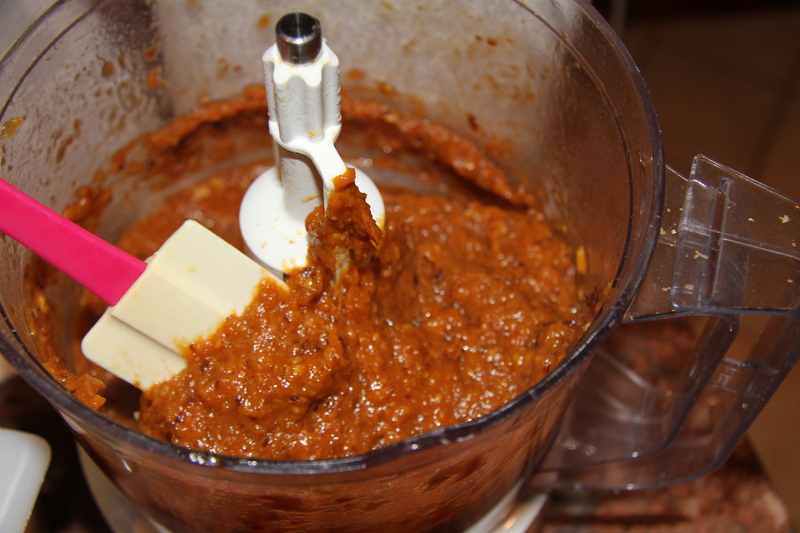 All pureed into the spreadable paste. 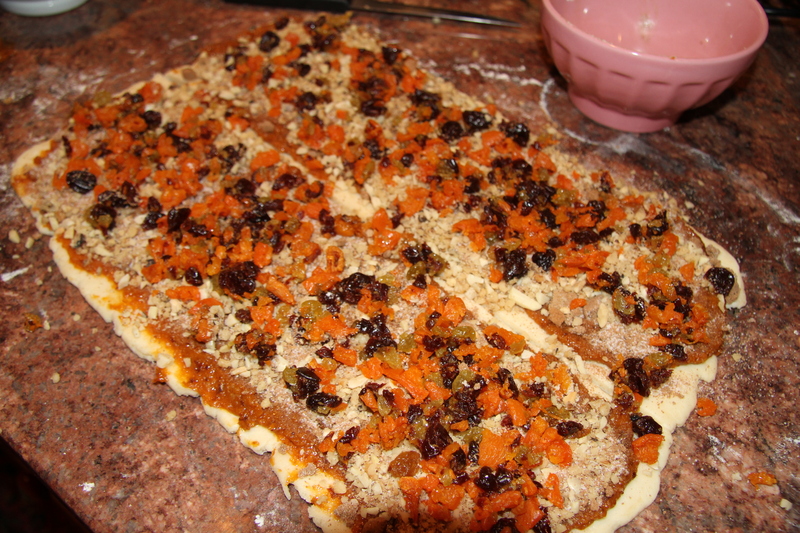 The lekvar is spread on the cream cheese pastry dough, topped with nuts and more dried fruit, then rolled and baked. Simple, not too sweet and so pretty. 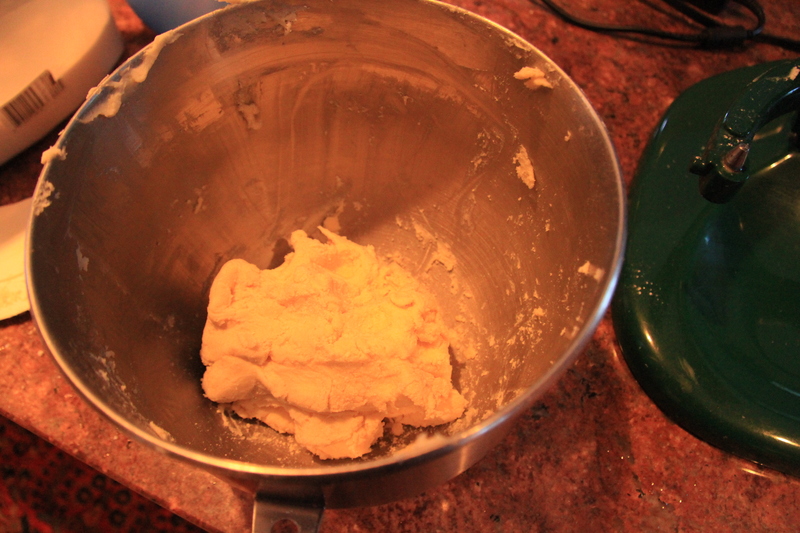 The dough is made in the mixer. Emergency subject change and news flash. My first Kitchen Aid mixer is broken. I was making many, many croissants, and used the paddle to work together the detrempe. On the last batch... snap. All motor, no action. I have another mixer, but that was the first one I bought for the bakery and she'll be off to the repair shop for a quick repair. It's funny, that little mixer always seemed a little more fragile than the others. Today, I'm working in the house with the mixer that gets the least amount of use. We should be in good hands. Back to the dough. The dough is made with cream cheese. It works together beautifully and is very soft and easy to work with. Since the dough is going to be rolled into a rectangle, it's always a good idea to shape the dough into that shape before chilling. So pretty! I really like apricots and prunes. For this recipe's lekvar, I used about 2 cups of apricots and a few prunes for color and taste. The almonds were toasted, slivered and worked really well. I really like the color of the finished product. It tastes and smells SO good! The recipe for the Rugelach requires lots of prep in little bowls. Nothing too fussy, but you need to make sure you'll all set before you start to fill the dough. This is kind of an ugly photo, but wanted to show all the components set to go. 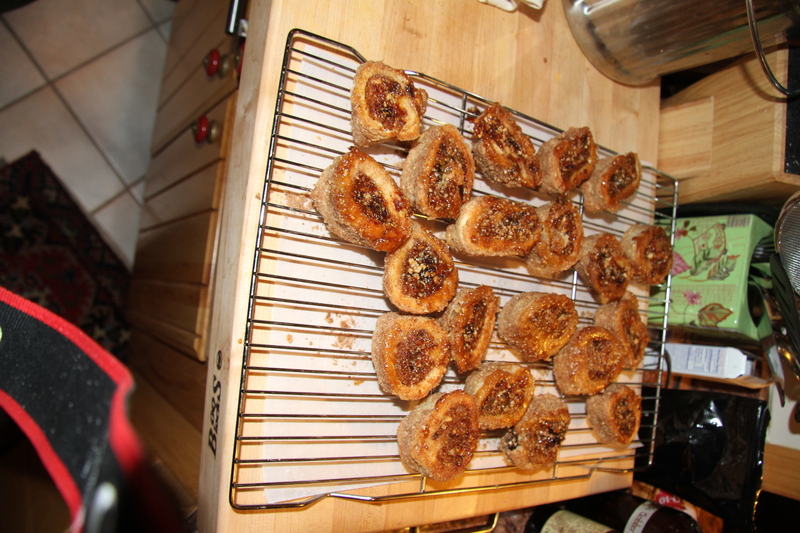 The rolls chilled for four hours, and then were egg washed, cut and rolled and a delightful nut, sugar, cinnamon combo. I wasn't planning to stay up late and wait to bake them, but I'm in for the long haul with this recipe. There must be something good on TV! We really liked the recipe. I'm not positive that they were completely done, but they were nicely caramelized and had been in the oven for 30 minutes. The dough was still tender and soft, I was expecting a little crunchier. The fruit and nuts were really good. 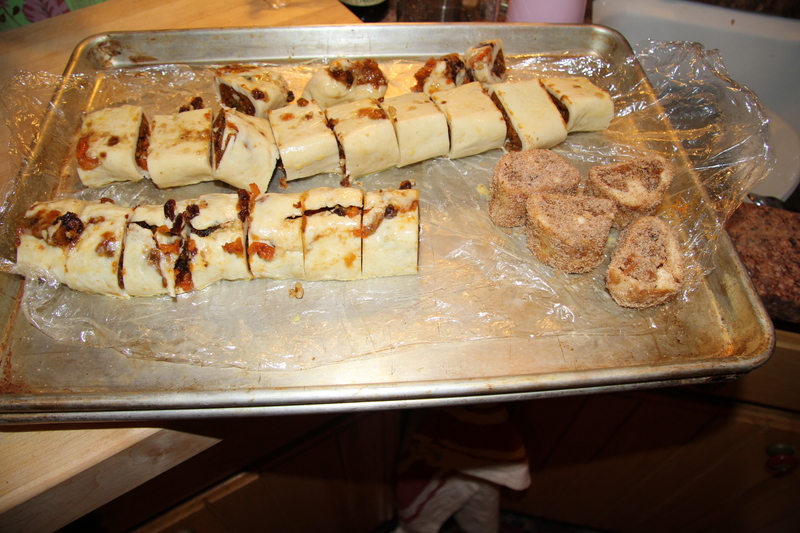 Just click the link to read more entries for Rugelach on the Baking with Julia website. In two weeks we'll be making Irish Soda Bread! Another great recipe. if you're looking the the recipes, the host each week will add the recipe to their post. It should be one of the first posts of the group. Anyone can join the fun. Pick up a copy of the book and start to blog! I'm back after a few vacations ready to cook, bake, entertain, enjoying the warmth and sunny days of spring. This week's FFWD recipe was a true celebration of spring. 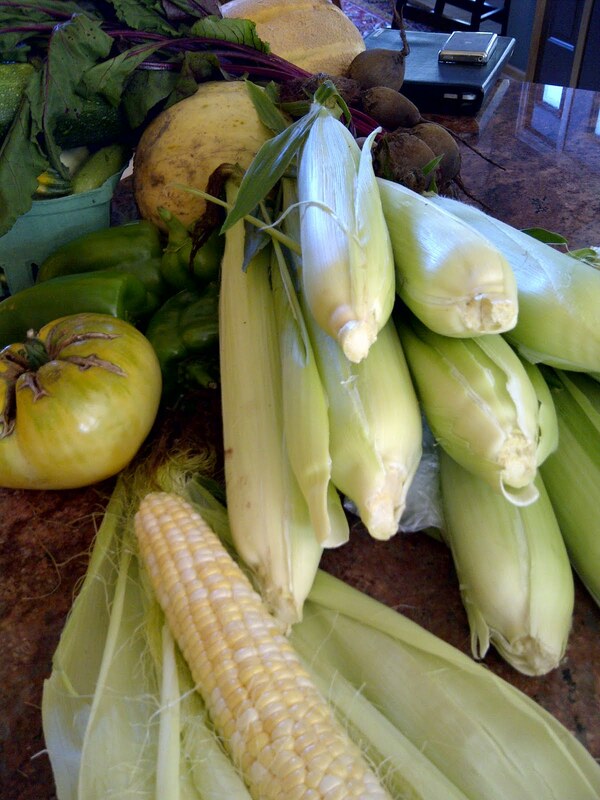 It was also a celebration of friends and local foods. 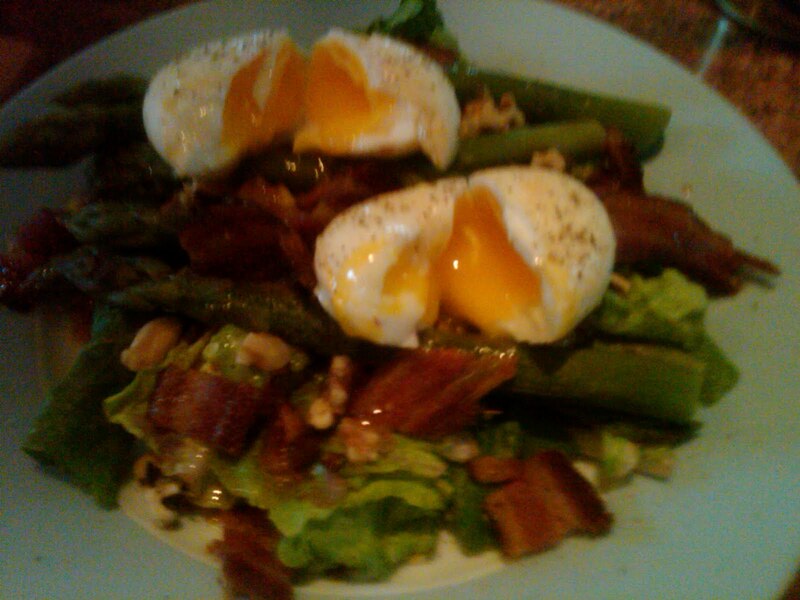 The recipe is Bacon, Eggs and Asparagus Salad. It was so much fun to make. The ingredients are simple and when each is cooked to perfection, the combination is delicious. I'm also including our dessert, Rhubard Custard Tart. More on that later in the post. On our early spring trip to Asheville, NC we spent time with our freinds, Jerry and Nancy. At one of our brunches, we had delicious bacon at The Early Girl Cafe. Jerry mentioned that they have a source for terrific bacon and would send some. About a week ago, we opened the mailbox, and found a box filled with pounds of fantastic bacon. For any bacon officianados out there, it's Benton's Hickory Smoked, from Madisonville, TN. 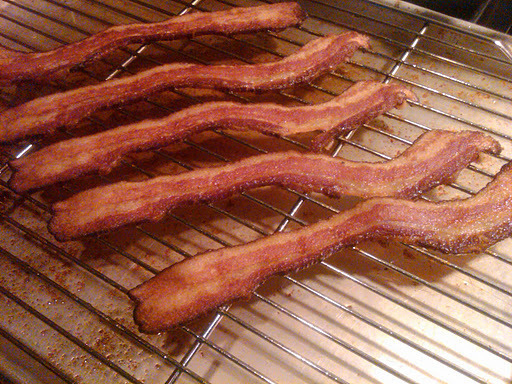 http://bentonscountryhams2.com/ Recently, I started baking the bacon in the oven rather than cooking it on the stove top. Just place a rack over a pan and roast in the oven at 350-400 for about 15-20 minutes. The bacon will stay flat, be crisp, not greasy, and best of all... not make a mess on the stove. Here's the finished bacon, waiting to top the salad. I wish I could include smells in this blog! Last night I finished a farmers market and had some croissant and pain au chocolat left over. Our friends who are huge fans of French pastries were home and happily agreed to adopt the soon to be "day old" treats. They offered me asparagus and rhubarb in exchange. We all felt like we got the best of the deal! We walked through their beautiful gardens. My friend sliced off the asparagus, and made fast work of trimming the huge rhubard leaves. I knew just where both would be used! 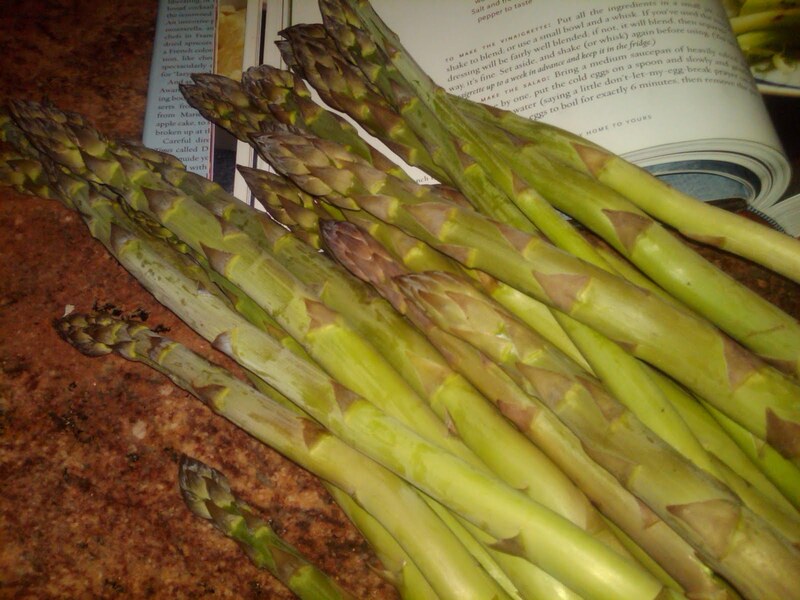 For the salad, the asparagus is boiled in salt water for just under 5 minutes. I like it a little more tender, so a didn't rush to drain it. The eggs came from a local vendor. So pretty! 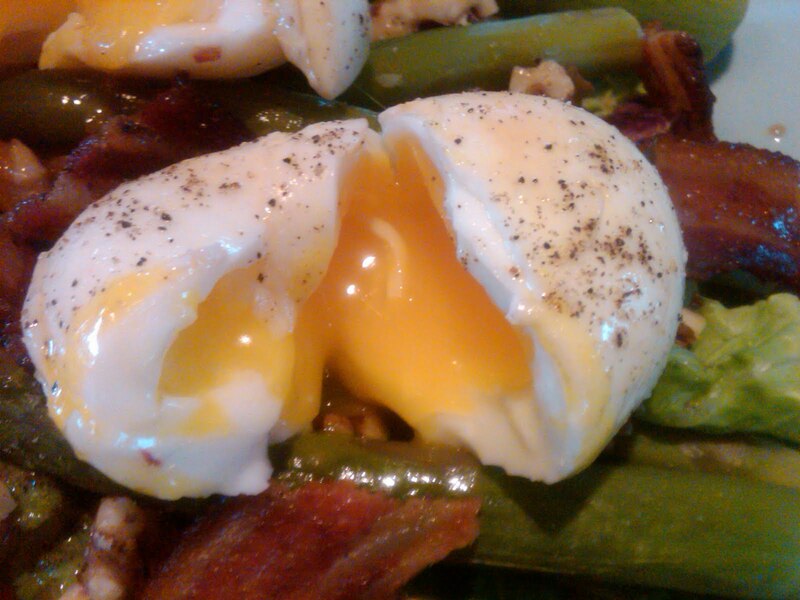 In Around My French Table, Dorie walks you through making a perfect soft boiled egg. If you haven't bought the book yet, here's the plug! The techniques are so well described, it takes the fear out of first time tries. Back to the eggs... The white is tender and the yolk oozes gently when the egg is cut through. It was fun peeling the shell off without squishing the egg and breaking the yolk. OK, these aren't the eggs I used, but the very similar. 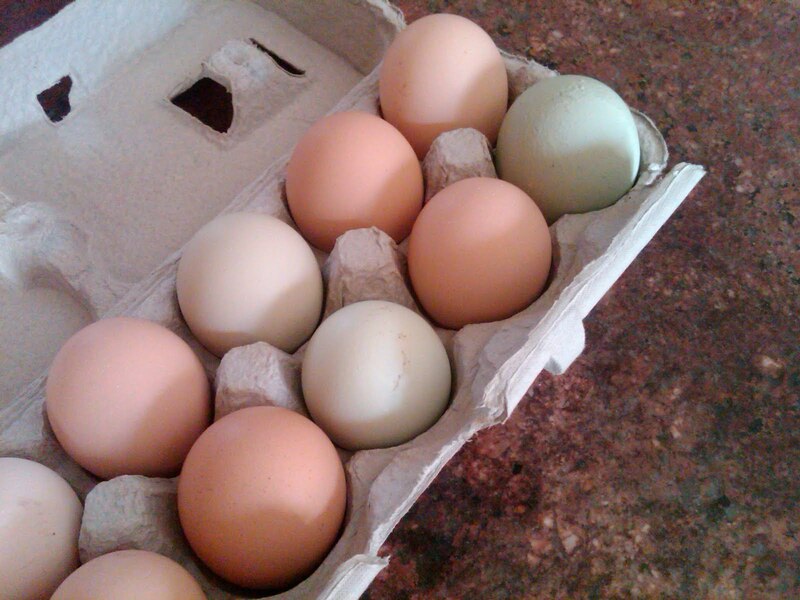 I used this picture because some of the eggs were green and blue, and I love them! These eggs above were a hostess gift from a gathering we had this winter. How cool to be given a dozen eggs. Aren't they pretty? I would highly recommend this recipe as a spring supper or luncheon salad. 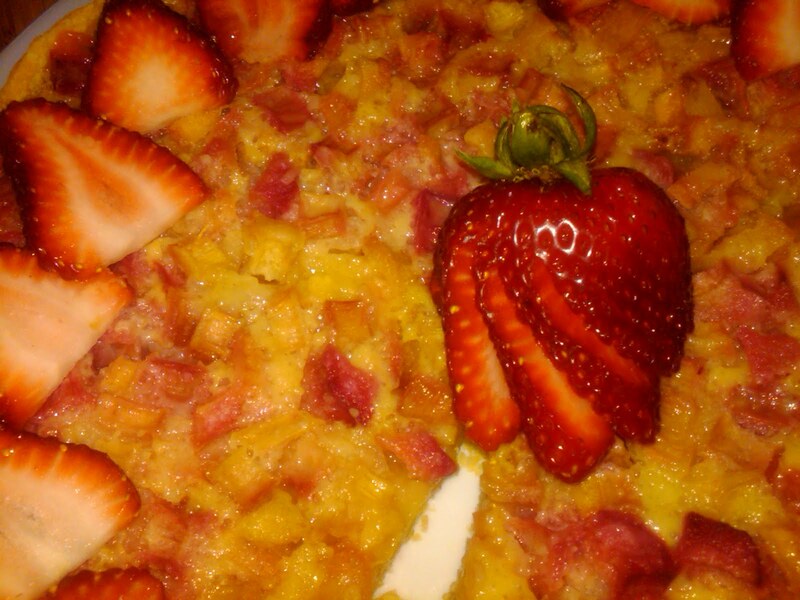 To finish the meal, I made a rhubarb custard tart. I've never been a huge fan of rhubarb, mostly due to the stringy texture. This recipe calls for diced rhubarb. 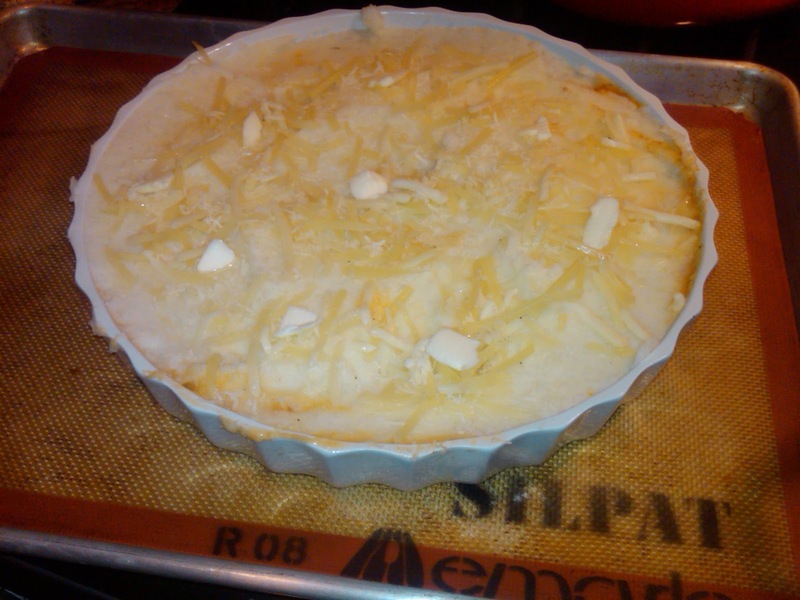 I cut it into a small dice, and made a French style tart, omitting the top crust. The baking time was the same. I used strawberries as a garnish to add just a little extra sweetness. This was a big hit. Gary and I both really liked it. No strange texture, and a nice sweet and tart taste. Here's the recipe if you'd like to give it a try. Whisk yolks until thick. 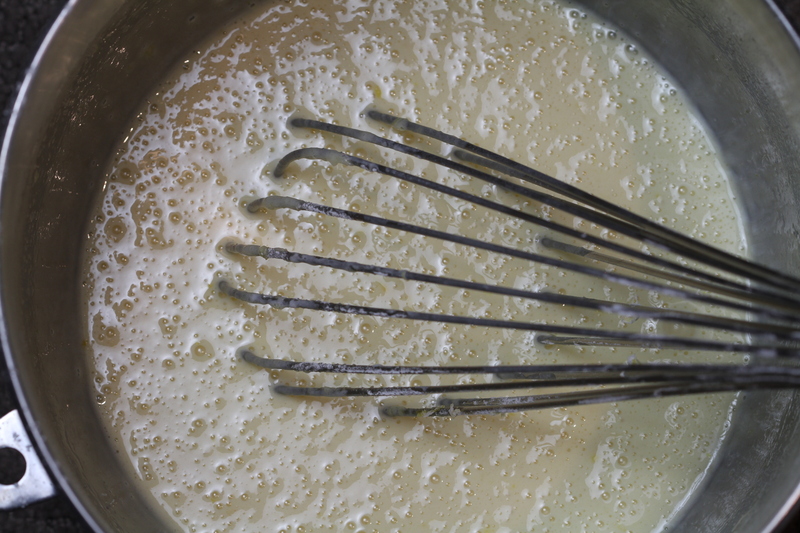 Add sugar, whisk until combined and thickened. Add flour, butter, and rhubarb. Pour into unbaked tart or pie crust. Bake at 425 for 10 minutes, then at 350 for 30 minutes. If desired, you could place another crust on top. Be sure to crimp and vent. Garnish with strawberries and/or whipped cream. Enjoy! It's been a crazy week here in Wisconsin. Madison is only an hour away. I've been busy attending rally's to support union members who are fighting to keep the right to collectively bargain. I took a break to make the FFWD recipe of the week. It took three tries to find fresh green beans in a grocery store. This may have been a recipe to hold off on until summer, but the beans I found looked good. The recipe is very straight-forward and quick. The pancetta added a very nice flavor. The butter a very nice addition. I'm kind of a vegetable wimp and tend to like vegetables a little overfilled. I followed the recipe exactly, and found the beans still crispy which would appeal to most. I would have likes them cooked a little more. We ate the beans with fish and enjoyed them. I'm really looking forward to next week's short ribs! This week's French Friday recipe is the Orange Almond tart. It's been a busy week surrounded by chocolate, chocolate, chocolate. This recipe was a nice change of pace, and still very sweet and romantic. I've made many almond cream tarts. This almond cream is very soft and rich. It's also called Frangipane. Dorie's tart uses an interesting crust very similar to shortbread. It was very straight-forward, and delicious! 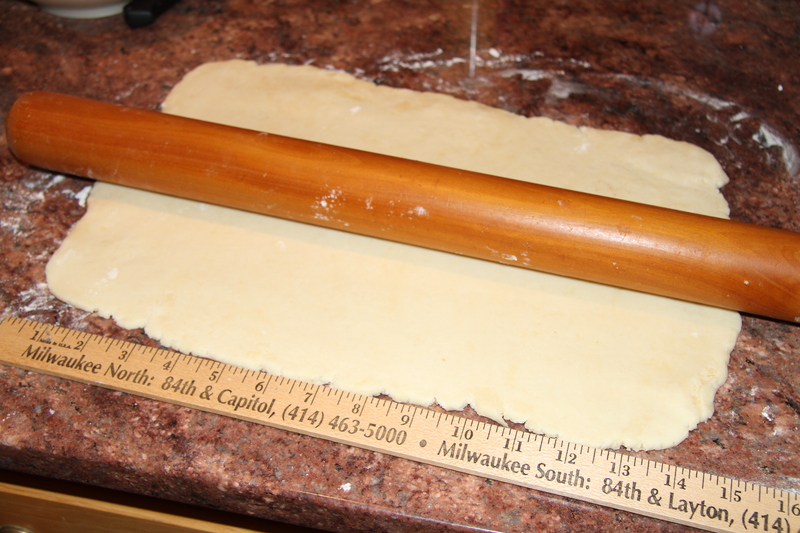 Two methods were suggested for putting the crust into the tart pan. I used the press-in method. The dough is very soft and this seemed much easier. One on my favorite things to do in the pastry world is cutting perfect little orange segments from the orange. This recipe used 3 oranges. After trimming all the peel from the orange, I slid the knife just inside the membrane on each side and lifted out the the perfect orange pieces. I don't know why that's so fun, but it is! The smell and taste are amazing. The dessert was the finishing course to a great dinner with freinds. Of course, a Valentine's weekend dinner needed chocolate of some sort, so we made sipping chocolate and had a box of chocolate caramel bon bons from earlier in the week. For anyone looking for something delicate, delicious, and not too difficult, this is it! From my kitchen to yours, Happy Valentine's Day! 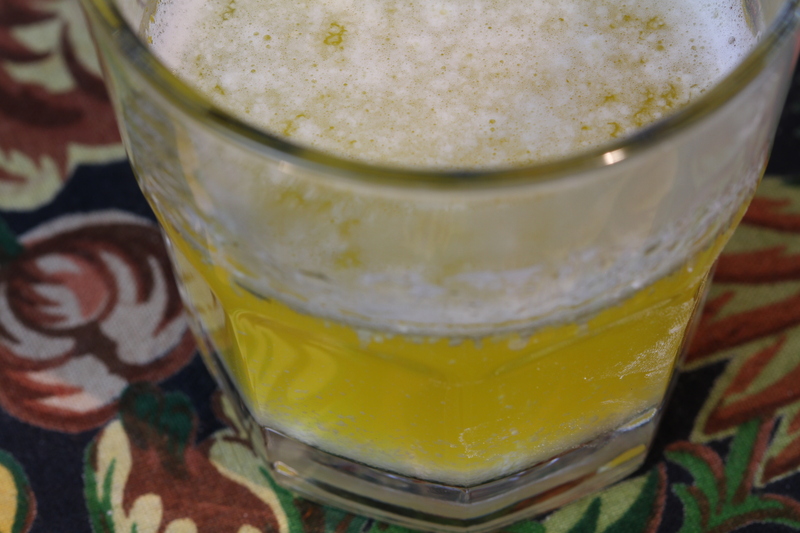 It's a snowy day and I'm looking for the perfect recipe to enjoy during a blizzard. I decided to look through Around My French Table, by Dorie Greenspan (AMFT). As I looked at soups and stews, I wondered if Ms. Greenspan had a website. Ta-da! Through the wonders of a quick internet search, I found it. After looking around the site and entering my email address for updates,I clicked on the "French Fridays with Dorie". A group of cooks creating her dishes from AMFT and blogging. How fun! I've registered and hope to have the password soon to join the fun. I hope that you'll join me on this journey! I know it's sort of Julie and Julia, but to have the author participating in the process will be great. For those of you who already own the book, I know you share my love of the book. It's been the hit of the season. In fact, it's a topic at many get-togethers. For those that don't yet have a copy, I encourage you to take the plunge. One of the rules of the "Friday" group is that the recipes stay in the book. I look forward to sharing the journey as I cook my way through to book with people from all over the world. Over the past few weeks I've been thinking and referencing the great works of dear Julia Child. Her personality radiates through the pages of her books. At the recent demo day at Bekah Kates, a kitchen store in Baraboo, I used Le Crueset cookware to demonstrate its wonderful uses. The recipe I made was Julia's Boeuf Bourguignon. I made it three times, actually. Once at home before the store opened for tasting during the morning, and another while people shopped. The smell of the deep, rich sauce greeted shoppers as they entered the store. Several times people asked me, "it that "HER" recipe? ", or, "did you see the movie?" We all knew who we were talking about. It just wasn't right not to make it just one more time the next day while spending time with friends. Julia would have insisted! As the leaves fall, give it a try! About a month ago, I had a surprise arrive in the mail. I had pre-ordered a cookbook and it arrived. Not just any cookbook. One of the best I've seem in a long time. Dorie Greenspan, author of Baking With Julia, just wrote another amazing book, Around My French Table. Each recipe is well written and looks delicious. While it's a beautiful book, it will be used and will be marked with the little sauce here, and a drip or two there. Ms. Greenspan has a great blog if you're interested in learning more. Another piece of Julia news! In late October, ahead of schedule, As Always, Julia: The Letters of Julia Child and Avis DeVoto is being released. I can't wait! It's hard to imagine a book being better then her My Life in France but it will be fun to see. My most recent Julia moment was on Friday. I made a wedding cake with spice cake and apricot lekvar filling. The lekvar recipe was Julia's from Baking with Julia. It's a delicious apricot paste with almonds and hint of brown sugar. It's similar in consistence to thick applesauce. The color is a deep pumpkin color which makes it a wonderful topping for scones, too. 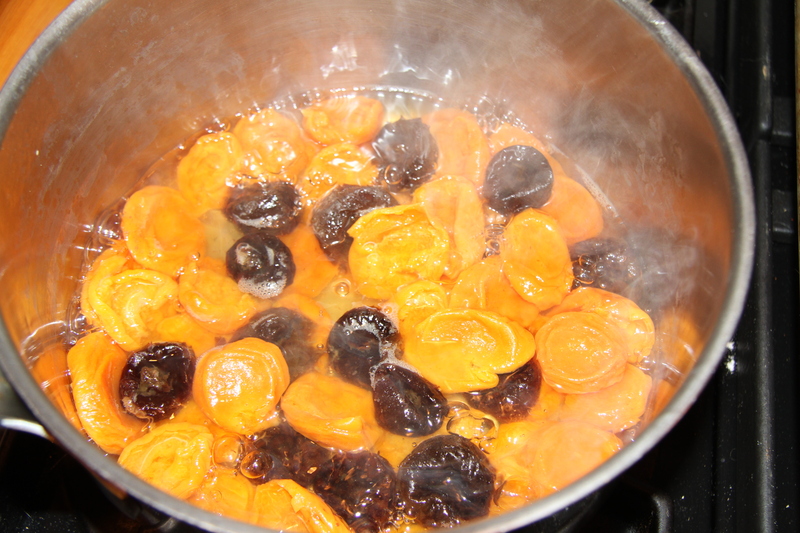 Simmer the apricot, water and zest until the apricots are soft. Combine apricots, brown sugar and almonds in a food processor and mix until smooth. Spread in a pan, and cool, covered with plastic wrap. 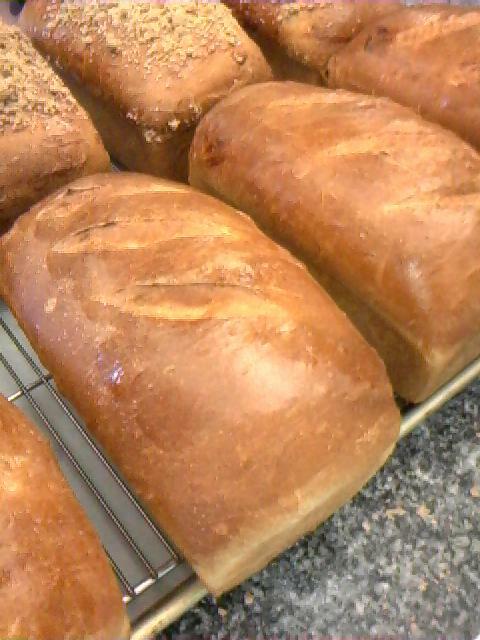 Enjoy on scones, muffins or even as a cake filling. Will keep 7-10 days in the refrigerated. Enjoy autumn baking, cooking and entertaining. Until next time, Bon Appetit!